Fermented Pepper Sauce | Smoking Meat Forums - The Best Barbecue Discussion Forum On Earth! Discussion in 'Peppers' started by flagg, Jul 11, 2016. I am fermenting about 1 gallon of pepper sauce. First time trying this... any suggestions? 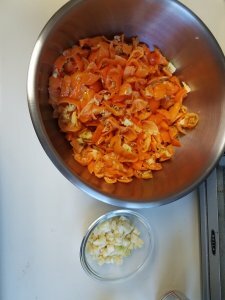 I have two "recipes" going. First is 2 lbs of mixed peppers: cayenne, habenero, jalepeno, paprika, and sweet banana peppers. Turned to mash in blender with filtered water and about 5% salt by weight of mash. Put in 1/2 gal mason jar and let it start to ferment. Stir it about twice a day. Smells a little funky after one week, but good taste with nice bite. Second is same pepper mix minus paprika. Added garlic. 3% salt brine and blended. 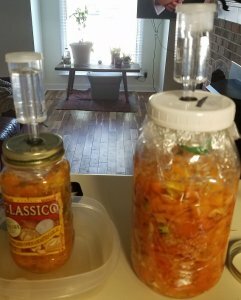 Split between to quart jars with air locks. Put a couple tablespoons of the first batch in to inoculate. Plan to add oak to the first to mimic barrel aged sauce kinda like tabasco. Nor sure if acidity will be low enough to forego adding vinegar to make shelf stable. Plan to bottle in about 3 months. I will post some pics in the morning. Batch 1 (half gal jar) started growing a white mold or something. Flavor was off. Considered a failure. Batch 2 seemed to stop fermenting. Added about 1/2 to 3/4 cup vinegar and blended about 3 minutes. Let age in fridge for about a week. Bottled in 4 Oz bottles. Checked pH... 4.0, so it should be shelf stable without refrigeration. One thing that can help with the mold issue is not grinding the peppers before fermentation. Keep them in larger chunks and use something to weight them down if necessary. I cut a piece out of a plastic food storage container that fits the jar but is smaller than the mouth. Works great at keeping the peppers submerged. In addition, stirring every day is putting oxygen into an aneorobic fermentation and asking for mold growth. For what its worth, and a year later lol, the 1/2 gal batch was probably not a failure. The white growth was most likely Kahm yeast, which is harmless. Simply scrape it off and let the ferment continue. Now, if the growth was some other color, or was fuzzy, that be bad.